One of my New Year’s resolutions for 2013 was to redesign my personal website. It didn’t happen. I think most web developers tend to neglect their personal site a bit because they are always working on other projects. At least that seems to be the consensus with my coworkers. 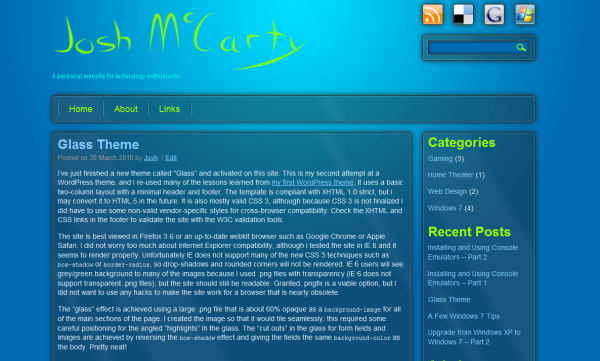 Well, it’s still pretty rough around the edges, but JoshMcCarty.com has a new look for 2014! I had reworked the logo a few months ago, but other than that I created the new theme in a few hours one evening using snippets of code from a few recent projects. I kept the design very simple, which made it easy to build quickly. 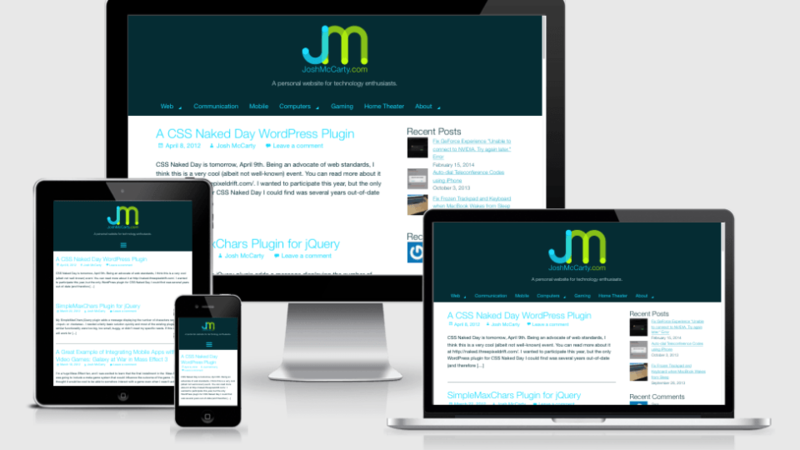 Thanks to tools like Grunt, Sass, Autoprefixer, and the Underscores theme, it’s easier than ever to get a decent WordPress theme up and running. Using SVG is much easier these days, so naturally my site logo uses it (with a fallback to a .png image thanks to Modernizr and some code from SVGeezy). My previous theme, “Glass,” was inspired by the Windows 7 Aero interface, so it’d been around since early 2010 with only a few minor tweaks since then. This was long overdue! I intend to continuously tweak it over the next year when I have time. The Recent Posts and Recent Comments widgets are plugins I wrote myself that need some improvement, and I’d like to explore using icon fonts in more places on the site.